This landmark home was the original Hangen Ranch House, built in 1889. It was sited on the best spot in the wide open valley, and enjoys views of the surrounding mountain ranges, including a pristine Mt. Evans view! The house was greatly expanded in 1996, updated in 2009, and dramatically renovated in the spring of 2017 to create a new upstairs Great Room with expansive windows on two walls, wide plank hickory floors, a bar with appliances and LED fireplace plus a 2nd master suite with its own customized walk-in closet and bath. The 1st floor of the home is also freshly remodeled & expanded. 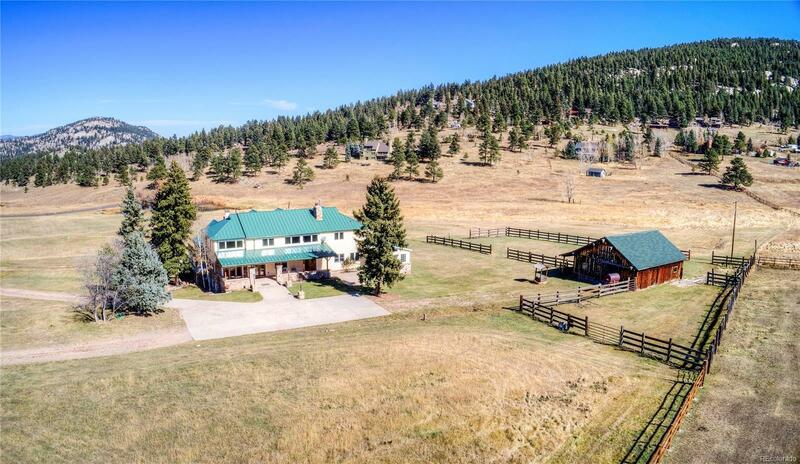 Pastoral setting is ideal for horses and features views of the neighbor's idyllic pond. Remodeled sky-lit kitchen with exposed beams, cherry cabinets, slab granite tops, walk-in pantry, heated slate floors and stainless steel: Jenn-Air 48" refrigerator, 2 dishwashers, Viking commercial range with hood and a microwave and compactor. Original stone fireplaces. 3 stall barn/fencing for horses.